A delicious new Weight Watcher’s low-calorie, low-fat twist on traditional tacos. 2. Place the taco shells on a baking sheet. Spread the refried beans evenly in the bottoms of the shells. Top each with 1/2 of the cheese. Bake until hot and the cheese is melted, about 8 minutes. 3. 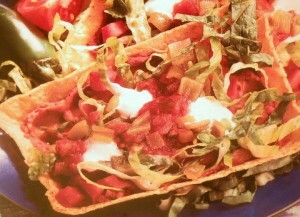 Top each chalupa with 1/2 of the tomato, lettuce, sour cream, salsa and chiles (if using). Per Serving: 200 calories, 5 g Total Fat, 1 g Saturated Fat, 1 mg Cholesterol, 510 mg Sodium, 30 g Total Carbohydrate, 6 g Dietary Fiber, 10 g Protein, 191 mg Calcium.